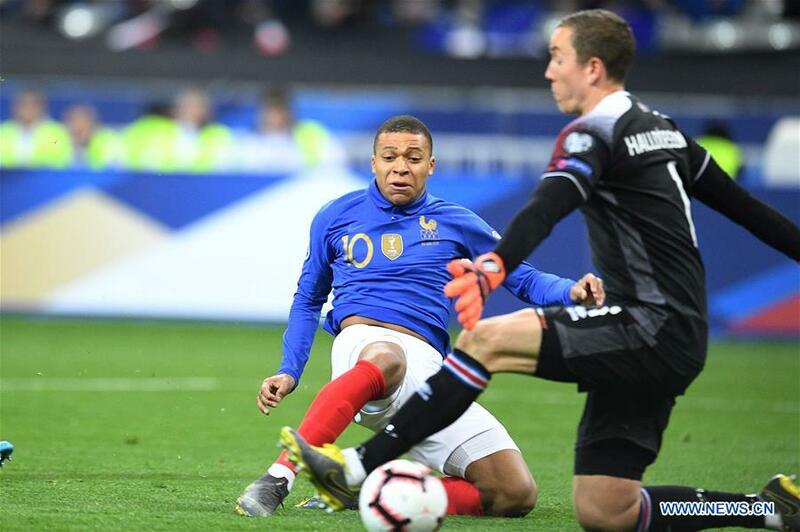 World champions France met little resistence from Iceland en route to a 4-0 home victory to make it two wins out of two in Euro 2020 qualifiers on Monday. The 20-year-old Kylian Mbappe shone with one goal and two assists. Samuel Umtiti headed the opener for Les Bleus. Olivier Giroud bagged his 35th goal to sit third among France's all-time leading scorers. Antoine Griezmann completed the rout at the Stade de France. French players wore special edition jerseys in commemoration of the French Football Federation's 100th anniversary. France's head coach Didier Deschamps decided to keep all his starters from a 4-1 road victory over Moldova three days earlier. Umtiti met Mbappe's left-flank cross and had a header at target off the inside of the post in the 12th minute. Five minutes later, Giroud gave Iceland goalkeeper Hannes Halldorsson a huge test to parry his header over the crossbar. The hosts dominated the second half. Halldorsson failed to reach Benjamin Pavard's pass in the 68th minute, only to gift Giroud a golden chance of putting the ball into an empty net. With his 35th international goal, Giroud has only trailed Michel Platini (41) and Thierry Henry (51) on France's all-time scoring list. Mbappe latched onto Griezmann's pass before poking home against defenders' challenge in the 78th minute. The duo reversed their roles six minutes later, as Mbappe's backheel pass released Griezmann to fire a low shot past Halldorsson. France sit atop Group H with a superior goal difference over Turkey, who thrashed Moldova 4-0 at home. Albania registered a 3-0 win away to Andorra in the other match of the group.